PSA: Bookmans East has a Young Adult Book Club. Have you ever read a book and desperately wanted to talk about it? Some novels, especially the best ones, leave us with a multitude of questions and ideas bouncing around our minds. We believe that the purpose of art and literature is to “hold a lens up to reality” (as aptly stated in Hitchhikers’ Guide to the Galaxy) as well as educating, expanding or challenging our own ideas – even ones we aren’t aware of. We’re calling all young adults! 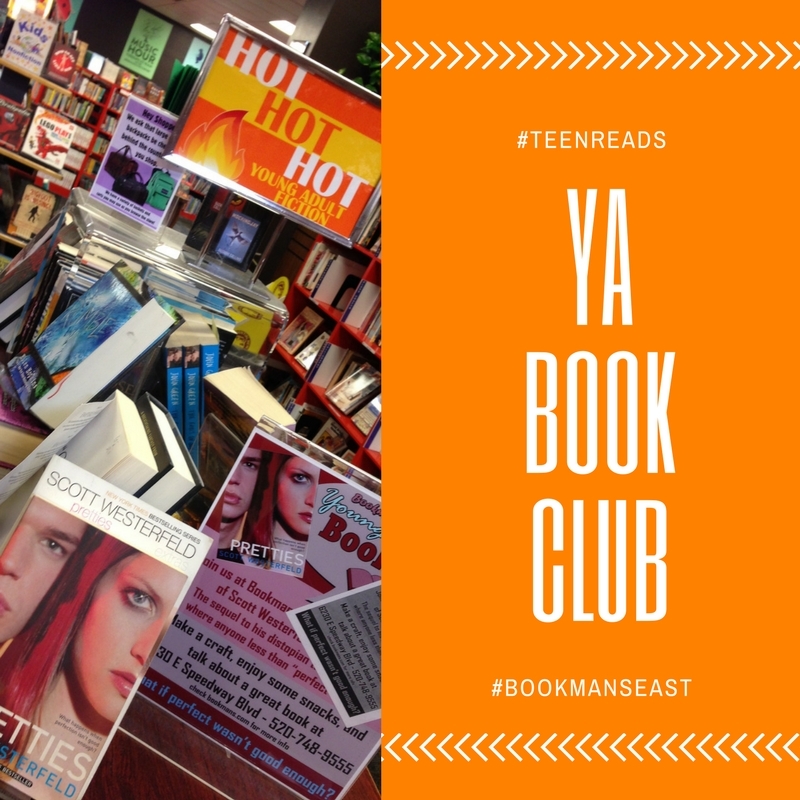 Bookmans East has a Young Adult Book Club and you are invited to join! The club originally began as a teen club but the excellence of the genre coupled with the attention Hollywood has given these titles inspired us to open membership to all young adults. Books such as Hunger Games, Maze Runner and Perk of Being a Wallflower and more have been adapted for the screen which bringing wider attention to young adult fiction. In fact, some of the most exciting ideas have come from what used to be works aimed at kids. It can be argued that fresh concepts are allowed to flourish here because writers don’t have the burden of creating ‘high art’ thus their imaginations reach into wilder terrain. This isn’t a new idea strictly speaking, Chronicles of Narnia, The Hobbit and Harry Potter were written for young audiences. It seems that authors were reluctant to leave the wild fancies and magical places that we explored as kids. Let us not snub our noses at the genre that gave us the eternal Alice in Wonderland and Wizard of OZ, which have both ascended to the stature of high art. These splendid tales have become classics in literature. The less restrictive genre gives authors the freedom to explore the foibles and flaws of human nature in ways that are often more imaginative than their adult counterparts. This is not to suggest that young adult fiction is any less profound, the opposite has actually proven true. Being magical or easier to read does not lessen their literary value. Ask any bookseller and they will tell you that some of the most satisfying reads can be found outside the classic fiction section. There is a lot to unpack in these stories, leaving book club members with plenty to discuss. Ultimately it is the readers opinions that are most important and one doesn’t need to be a professor of English literature to participate. The point of our events are to give book nerds like us a place to toss around their opinions with like minded people. Bookmans East Young Adult Book Club has been reading Scott Westerfeld’s Uglies series. While being thoroughly accessible, these 3 titles address a sensitive theme; what is beauty? Westerfeld takes us into a futuristic distopia where plastic surgery is the norm and everyone is expected to ‘perfect’ their visage while riding themselves of their supposed imperfections. The club meets on the 4th Saturday of each month from 1:00P.M. to 3:00P.M. and our next meeting is Saturday, March 25th. We will discuss the 3rd book in Westerfeld’s series, The Specials. Everyone is encouraged to join us, even if you haven’t read or finished our current read. Members snack, do activities and have lively, laid back discussions that are opinion based. Bookmans is most interested in what YOU thought of a title, if you liked the book or not and why! It is the perfect opportunity to sit back, relax with friends and talk about books. Copies of our current reads can be found in our store and can be purchased with our famous Trade Credit. So, check us out by dropping by or you can email questions or your confirmation to Dani at danielleb@bookmans.com. Look for future titles and times in our Events section of this website. If you have a favorite title, feel free to suggest our next read. This is your club and we are interested in what you are reading now! See you there!